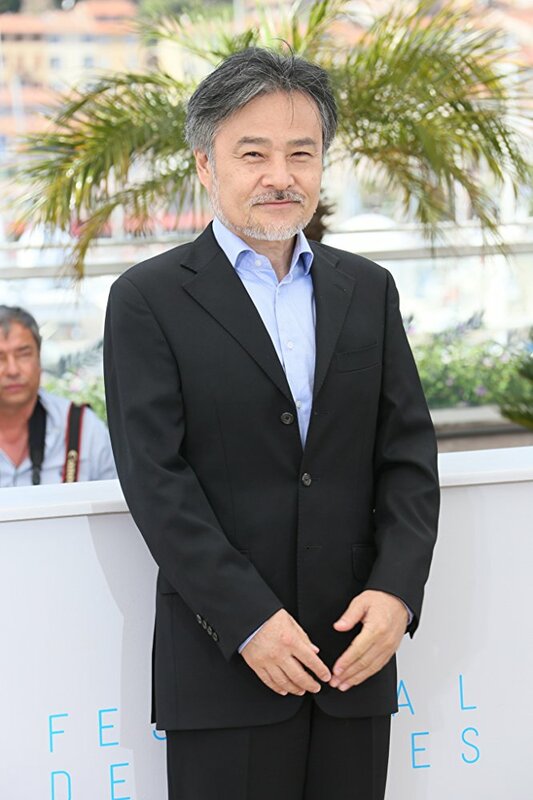 With 48 directorial credits (beginning in 1975), Japanese filmmaker Kiyoshi Kurosawa, whose movie, Daguerrotype, only recently opened here, already has another one hitting theaters this week. 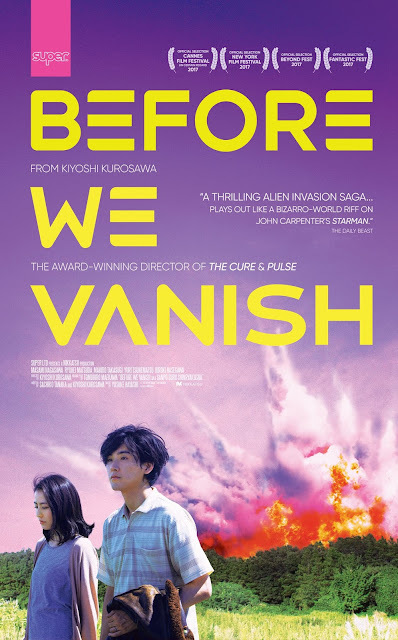 Better yet, his new alien-invasion-like-you've-never-seen-it sci-fi/thriller/comedy/drama, BEFORE WE VANISH, may well be one of his best ever. 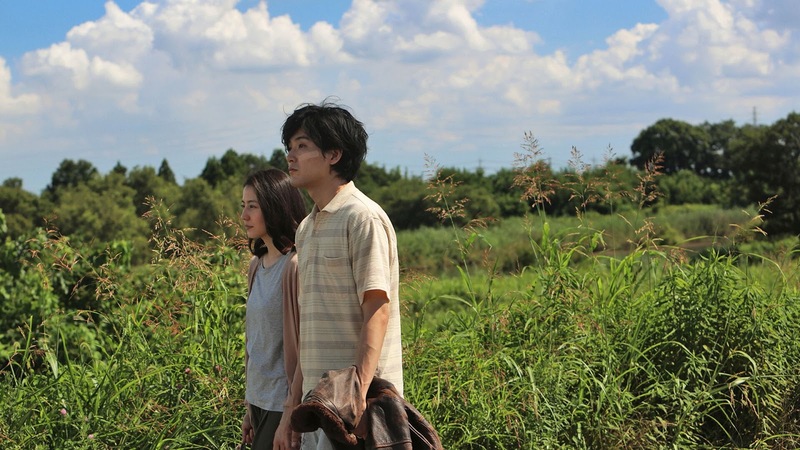 More surprising (to TrustMovies, at least) is how very poignant and moving it turns out to be. Mr. Kurosawa, shown at left, though he has made nearly 50 films, has had only seven of these (to my knowledge) released here in the U.S. Of those, I've found Dagguerrotype the least enthralling and Before We Vanish the most. The film is a kind of alien-invasion movie as seen through the view of only three of these aliens -- you might call them "scouts" -- whose job it is to assess the human population and gather what information they can from that populace before the real invasion begins and all human life is destroyed. As directed by Kurosawa with a screenplay adapted (from the play by Tomohiro Maekawa) by the director and Sachiko Tanaka, the movie immediately dumps us into the middle of things as we see a man in a hospital, recovering from an accident and attended by his wife. 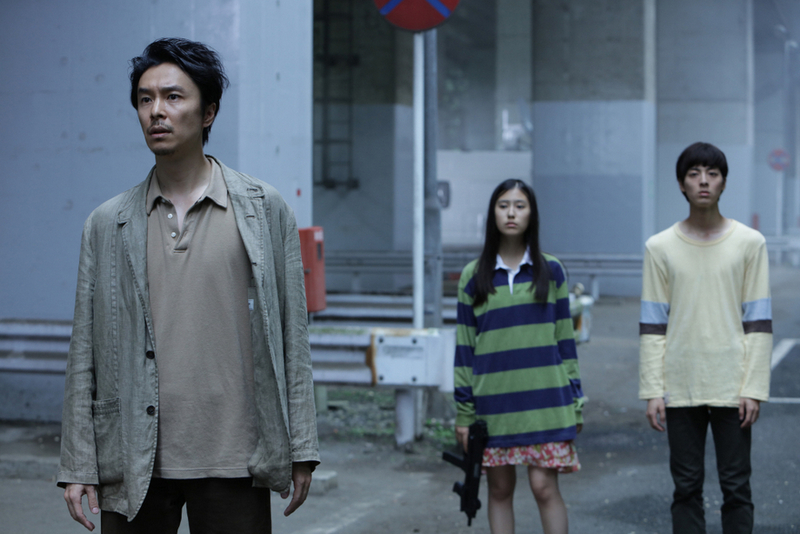 Concurrently, a young girl comes home from school to suddenly massacre her family and leave some other very odd damage in her wake. A third young man (below, right), wandering the street, picks up a human journalist (below, left) we've only just met to be his "guide." Yes, these are our three aliens, each of whom has taken over a human body (a nod, without pod, to Invasion of the Body Snatchers) and it is through them -- along with the several humans with whom they come in contact and interact -- that we come to understand who they are and what they want. Kurosawa is best-know for his nerve-jangling supernatural thrillers in which much of the scares come via indirection, surprise and sheer creepiness (the perfectly titled Creepy is one of his most effective), but here this talented filmmaker instead uses the scenario to explore another famous sci-fi trope used in films from well prior to the original Blade Runner to its recent woeful follow-up: What does it mean to be human? 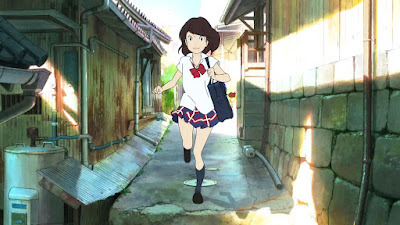 For my money Kurosawa and company do the best job so far of bringing this particular theme to grand, moving and even very funny life. The two younger aliens are brought to life well enough that we can glean a good deal of info about their "alien" character, one quite different from the other, and we come to understand and appreciate that cynical human journalist quite well, too. But the character who really nails this movie belongs to that third alien, the young man (above, left) who we first see in the hospital, along with his human wife (above, center). As a human, prior to his being "taken," our guy was evidently something of a rotter: a caddish player who treated his wife like trash. Now only his very attractive shell is left, inside of which resides a being who wants to learn all it can about humans and their lives. How this comes to be changes everything, and the journey that our very odd "hero" and his wife take, along with that journalist and a few other hangers-on makes for one of the most unusual, often amusing, and finally utterly moving and thought-provoking trips that alien-invasion movies have so far given us. Our aliens have the ability, as above, to draw out of us humans the "concepts" they want to understand. Things such as "work" and "play" and, yes, "love." How the removal of such concepts leaves the humans provides some of the more amusing moments in the film, but how these work on the aliens makes for even more confusion and surprise. 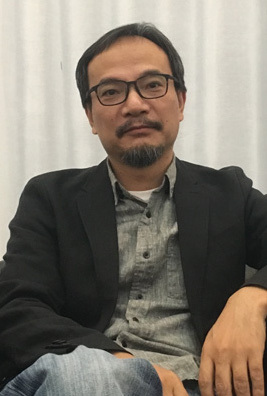 Kurosawa has larded his movie with a little gore, violence and action occasionally, yet special effects are kept to a minimum. (Has a small budget ever achieved quite this large a movie?!) 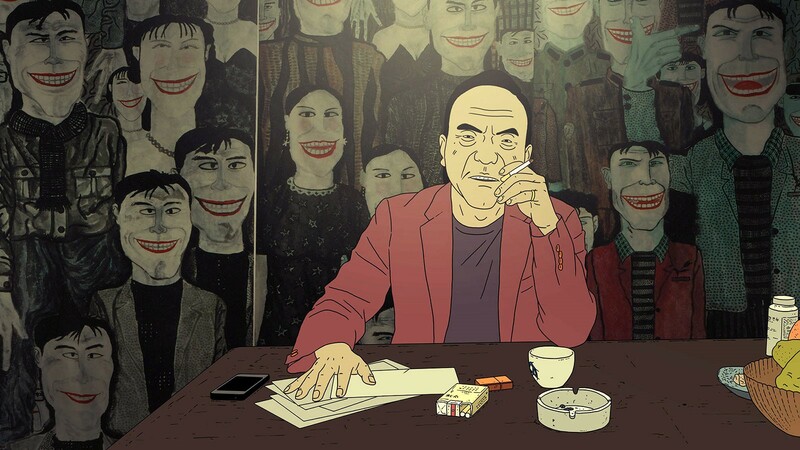 What holds us are the ideas and the wonderful subtlety with which the filmmaker works. How well he achieves this can be ascertained by how almost shockingly believable the movie is. You buy it, hook, line and sinker. 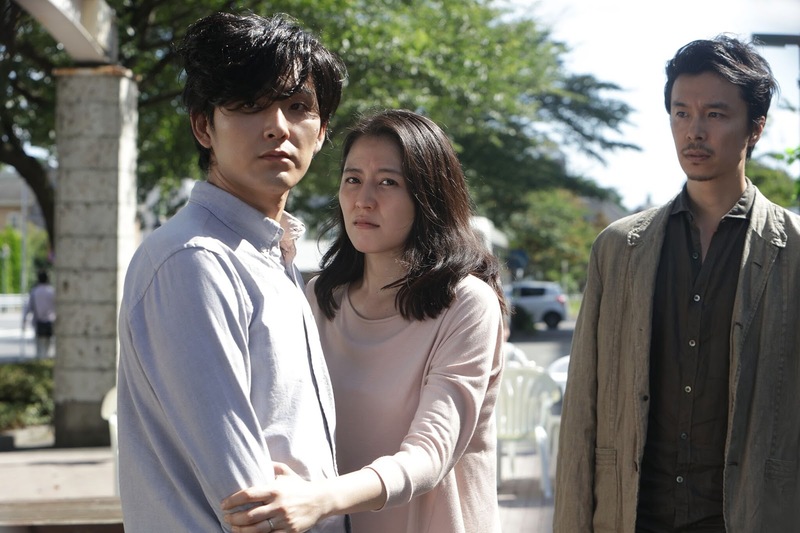 This is also thanks to the marvelous performances from his well-chosen cast: Masami Nagasawa as the wife, Hiroki Hasegawa as the journalist, and especially Ryûhei Matsuda (above and below) as the alien hubby. 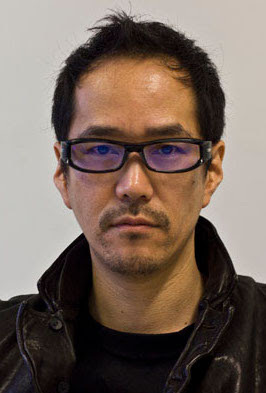 Mr. Matsuda has a face that is so beautiful yet vacant and pliable, especially in repose (which it most often is here), that he turns this alien into something quite special. There's a scene maybe two-thirds along that takes place in a church into which the husband has wandered in order to understand the concept of love. Inside a children's choir is singing, and the priest sits with our guy and tries to explain a few things. This may be one of the most perfectly realized bit of sci-fi wonderment ever seen, and it changes the course of the film. Though the concept may be Christian, I am quite certain both Buddha and Mohammed would appreciate it equally well. Moses? With his stern commandments rather than Jesus' loving beatitudes, maybe not so much. 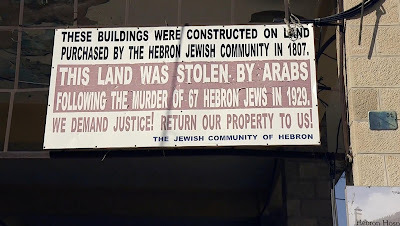 But then the Jews are still waiting for their Messiah. In any case, this is a less a religious movie than a humane one. I find it odd that, with all the supposed triumph-of-the-human-spirit movies made these days (many of them sentimental, silly hogwash), it would take an alien invasion film to truly (and so quietly!) make this theme resonate. From NEON's new boutique label SUPER LTD, Before We Vanish opens this Friday, February 2, in New York City at the IFC Center and will then play a number of Alamo Drafthouse theaters throughout the country. Click here to see all currently scheduled playdates and/or to find a theater maybe near you. If you can't find this film in a movie house, at least stick it on your list for future streaming, DVD or Blu-ray viewing. It is simply too good to miss. 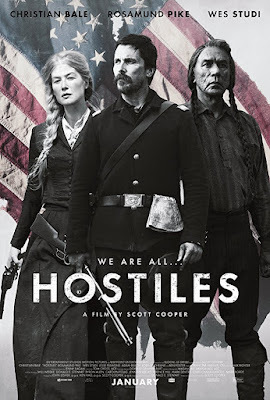 Or maybe last year's, as HOSTILES, the new movie from Scott Cooper, was released in limited fashion on December 22, in the rather ridiculous hopes of becoming an Oscar contender. 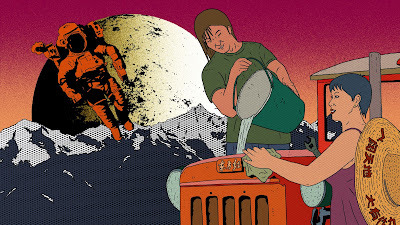 "Fart" film, for those new to this site, is TrustMovies' special name for a failed art film, and few I've sat through in the past 12, maybe 24, months, have failed on the level that this one does. Oh, its themes and intentions are all good -- pointing up unfairness of the treatment of our Native Americans, while allowing that, yes, some of them, did some pretty nasty things to those white settlers. Unfortunately, filmmaker Cooper (shown at right), who both wrote and directed the film (after giving us, also in the writer-director category, Crazy Heart and Out of the Furnace), is a fellow who insists on making certain we get the point. Every single last lick of it. Over and over. And as slowly as possible so that it has to SINK IN. Lasting two hours fourteen minutes, Hostiles may seem to you, as it did to me (and others in our audience) about as slow-paced a movie as you'll have so far seen. At one point in the theater, a patron near me asked, and very loudly, "When it something gonna happen here?!" This was followed by several voices adding, "Yeah!" and "Right!" I tend to keep quiet most of the time in movie theaters, but I must say I could not blame them. Though in all fairness, the movie does begin with an action scene, as a family of white settlers is summarily massacred by a group of wild Indians, with only the wife (the always excellent Rosamund Pike, shown below) barely surviving. 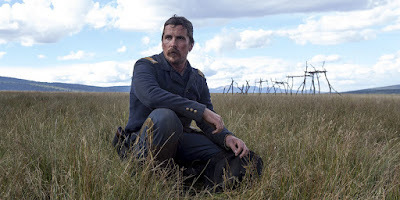 From there we go to a military fort, where an officer (the also always excellent Christian Bale, below, center, surrounded by his men) who has a multitude of reasons for hating the "red man" is given the assignment of bringing an Indian chief and his family (the Chief is played by Wes Studi, at left, two photos down), who had formerly slaughtered a number this officer's friends and has now been imprisoned for years, to an out-of-state Indian burial ground, where the Chief, who has been graced with terminal cancer, will surely die. If you maybe feel that this rather oddball situation smacks of heavy-handed manipulation -- does it ever! -- just wait. Along the journey, Bale and his crew discover Pike, in mourning for her own family, and of course they must bring her with them. Their journey is fraught with a couple more Indian attacks, but mostly it is burdened with a whole bunch of angst on Bale's part. 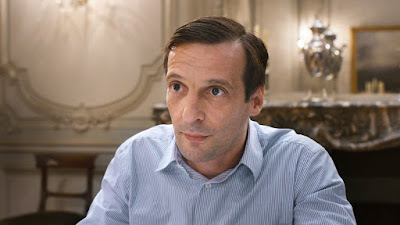 And while this actor is often particularly good with angst, here the stuff is piled on so hot and heavy that it drags the film consistently downwards. The screenplay, dialog and the visuals are as heavy-handed as the themes, and this tends to make even those few scenes that resonate emotionally hit you over the head so hard you'll want to run for cover. At least half the film's "moments" last far too long, as well, so that you're muttering throughout, "We get it, we get it." Robert Aldrich and Alan Sharp, in their excellent Ulzana's Raid from 1972, managed much of these same ideas so much better and stronger. Plus, their movie is a half-hour shorter. If you know that film, it will make sitting through this one all the more difficult. Finally, it is Hostiles' undue length, resulting in a kind of constant, overweening pomposity, that most thoroughly does it in. Yes, indeed, as the poster at top declares, We are all... HOSTILES, in yet another example of "we-insist-that-you-fully-understand-this-idea" mode. And the movie does finally bring whites and redskins together at last (while killing most of them in the process). But if, considering all that has now been done to the Native American population, you can actually buy the sweet/sad finale without wincing, you're a better man I am, Gunga Din. From Entertainment Studios Motions Pictures, the movie has now opened in a number of cities around the country. Click here to find the theater(s) nearest you. 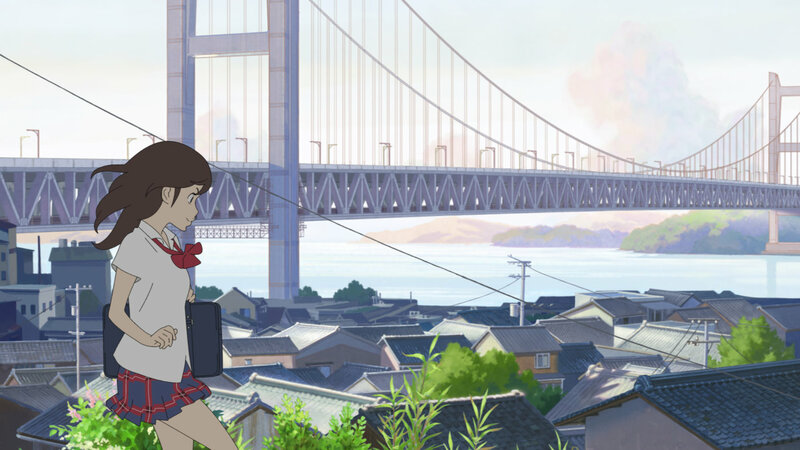 If the new animated movie from Japan entitled NAPPING PRINCESS seems initially a little too childlike and "adorable" to merit your full attention, hold on for just a bit. If you do, you'll soon find yourself involved in a tale of alternate universes -- one a kind of dream world, the other a reality that is heavily linked to the dream. 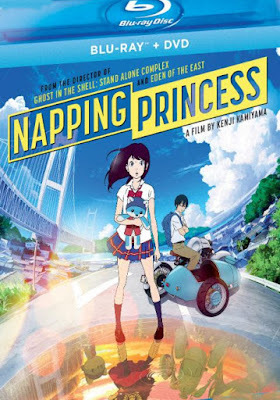 Initially, I wondered why they hadn't entitled this one, Dreaming Princess, but after viewing this really quite good children's film, I realize that the word "napping" is a lot more fun, reflective, too, of the main character's energy and smarts. As written and directed by Kamiyama Kenji, shown at left, the story here is actually rather complicated (I wouldn't be surprised if some older children may have to pause the Blu-ray or DVD along the way and explain certain things to their younger siblings), involving family history, an automotive dynasty, stolen technology for self-driving cars, and lots more. All of which gives this animated charmer additional freight, weight and wonder. 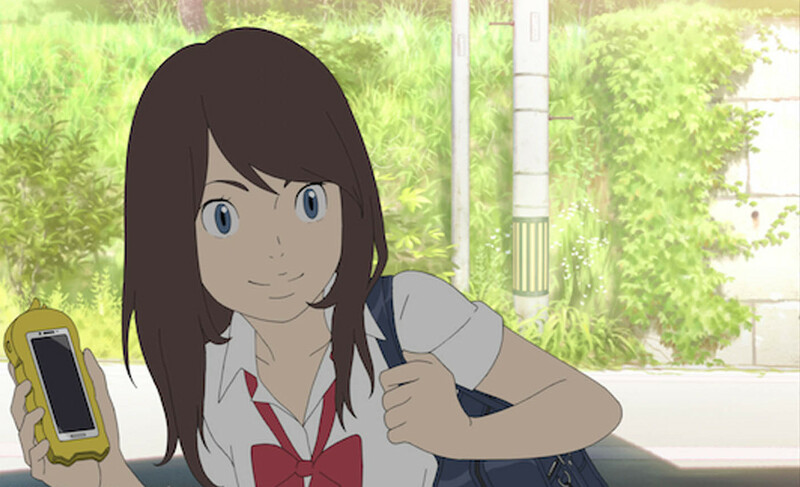 Napping Princess is by turns sweet, thrilling, funny, moving and consistently one hell of a visual treat. I wish that the stills shown below were of better quality because they simply do not do justice to what will be up there on your screen (via the Blu-ray version, at least). 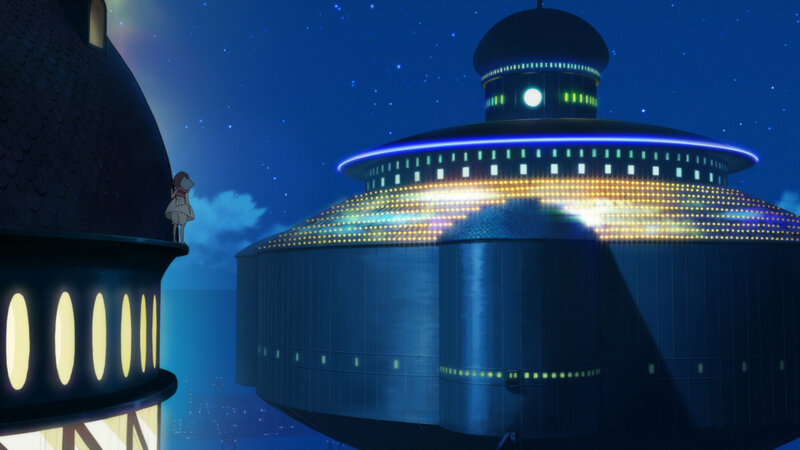 The colors are spectacular and the animation quite delightful. You'll particularly notice early on the film, I think, the breakfast that our heroine, Kokone, sets in front of her dad because you'll want to grab a fork and dig right in. 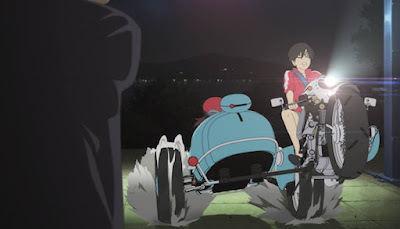 The landscapes, based on the actual Japanese locations, are also lovely, while the tale told here -- of an automobile dynasty and the struggle for its control -- will seem both specifically Japanese and simultaneously indicative of so much our Capitalist world today. Technology -- not only auto-making but smart phones, tablets, and the like -- come into play, as do cute little teddy bears, all of which makes the movie oddly enjoyable on several levels. 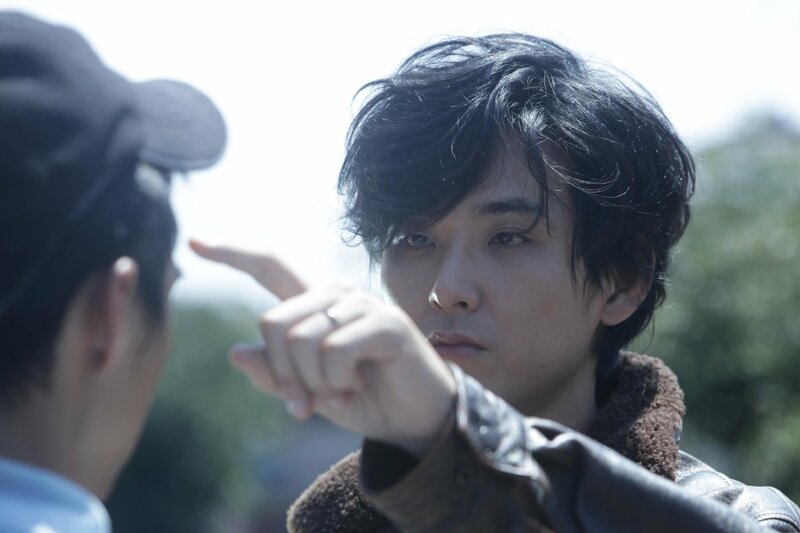 Mr. Kamiyama's achievement lies in how he manages to bring all this together in so relatively seamless a fashion. By the end you may find yourself surprisingly moved by the unfolding story of a shattered family and how it is reunited -- well, somewhat, at least. 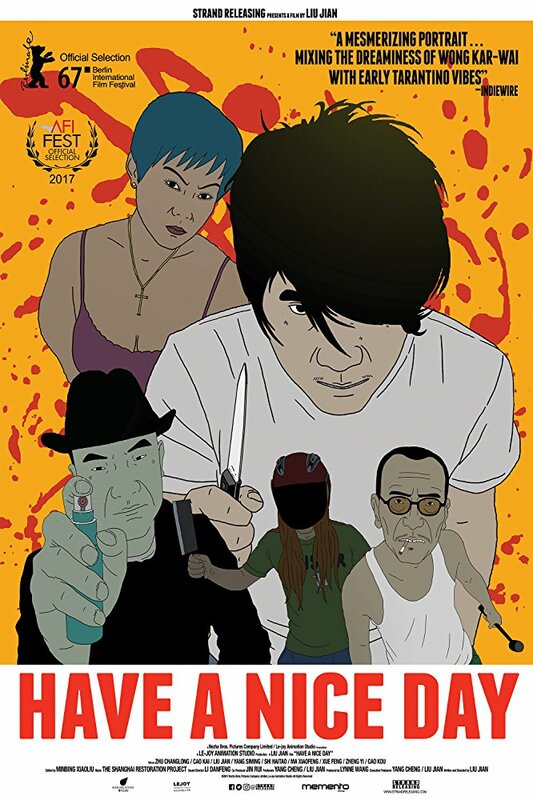 All the leading characters are brought to life quite well visually and aurally, and as the story gains momentum, you'll enjoy everything from plot twists and car/motor-bike chases to fights between monsters and robots (think Pacific Rim but a lot shorter and more fun) plus some inter-generational trauma and drama. Whatever you do, don't miss the sublime visuals that accompany the end credits. 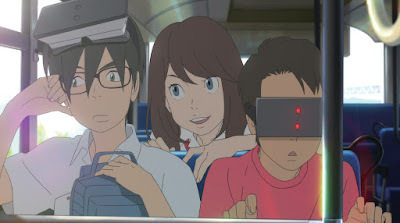 These give you, in a lovely animated version of archival footage, the family's backstory in a series of sweet, incisive snippets: a most charming end to a very surprising movie. From Shout! 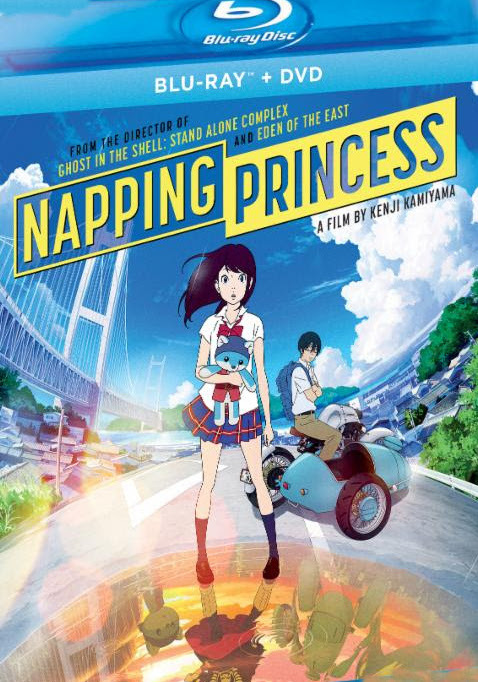 Factory and GKIDS and running a lengthy but never boring 112 minutes, and available in both the original Japanese version with English subtitles, and the English-language dubbed version (for younger children), the excellent two-disc set containing both Blu-ray and DVD, with a host of special features included (the 15-minute interview the writer/director Kamiyama is definitely worth seeing), the package hits the street tomorrow, Tuesday, January 30. 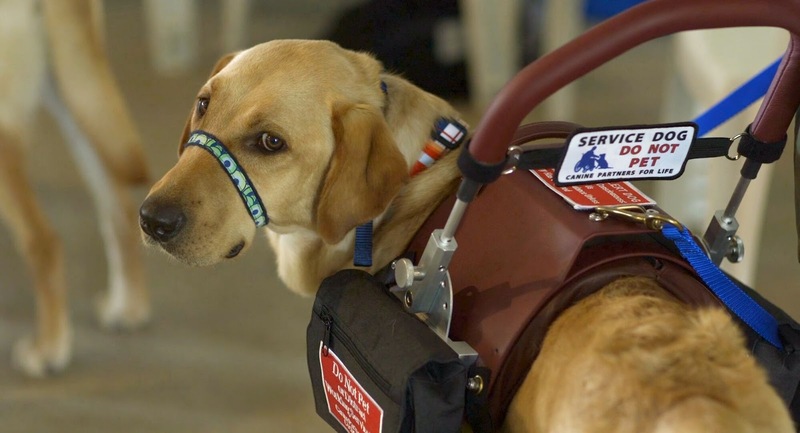 I can't imagine any animal-lover or viewer interested in service dogs not lining up to see a new documentary that has been quite a hit on the festival circuit and makes its VOD debut this coming Tuesday, January 30. 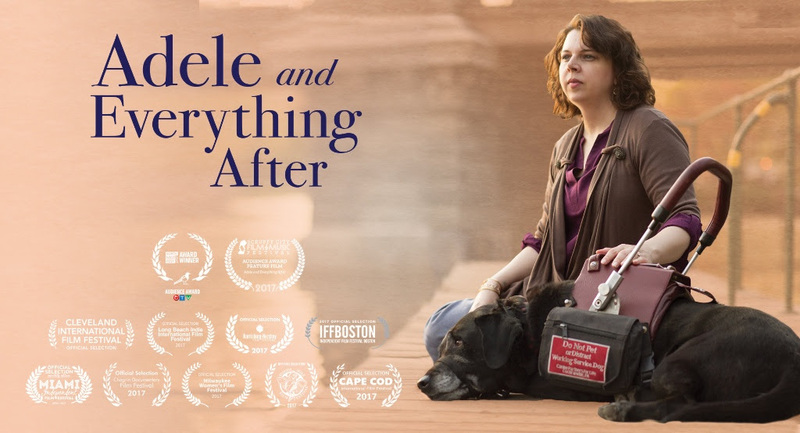 ADELE AND EVERYTHING AFTER, directed by Melissa Dowler (shown below), is the story of a young woman named Marty who has had since childhood an unusual kind of heart disease that can cause her to suddenly faint at any time and any place, sometimes leaving her bruised, bloody and concussed. Marty's history is provided via archival footage and some enacted re-creations, but the heart of the film is given over to this woman and the two dogs who most help her: the titular Adele (above, with Marty), the first of the two, and Hector (below), the second. 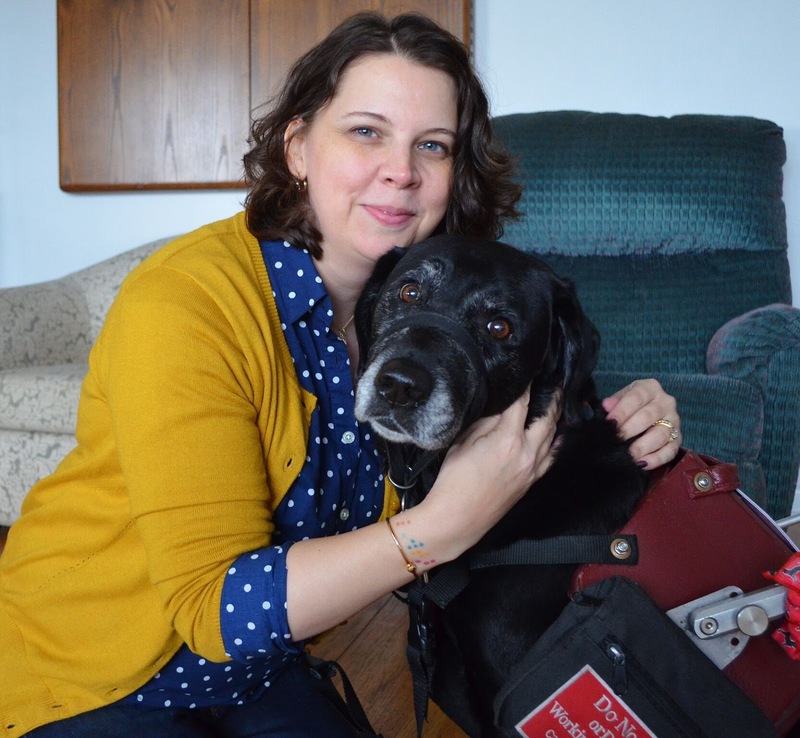 The wonderful organization, Canine Partners for Life, who supplies Marty's animals, is given a lot of screen time, too, and it is fully deserved. 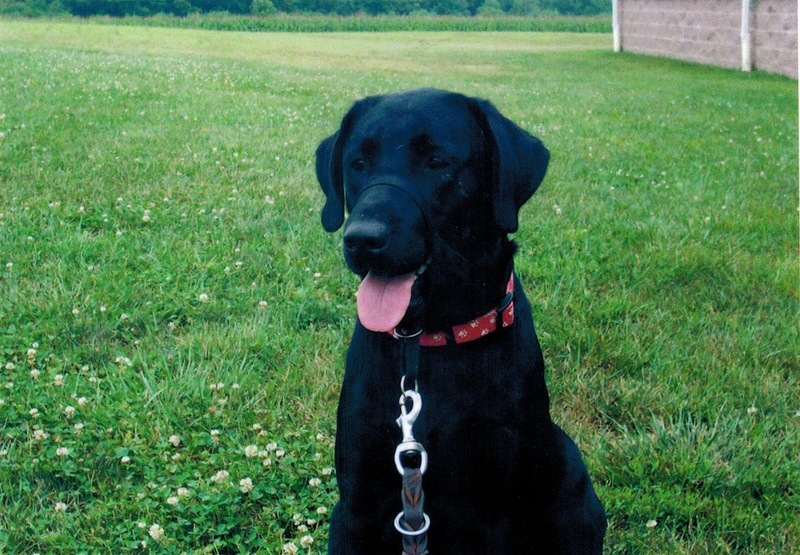 We watch, as the new owners learn to train their dogs and come to understand their "language," and how the dogs eventually respond with such full-out help that it's sheer amazement. How do these dogs manage it? It's not all that clear as yet, but what is clear is that they do it. And they do this constantly: in the pool, on the walk, at home, at work. Amazing. Once Marty, and we, get over the upcoming loss of Adele and the change-over to Hector, you'll use less of those tissues. For me, the most upsetting part of the film was wondering and not knowing how Adele herself felt about the loss of her "patient." Of course, that's anthropomorphizing, isn't it? But this proves difficult not to do, when the animal figure is as important as here. 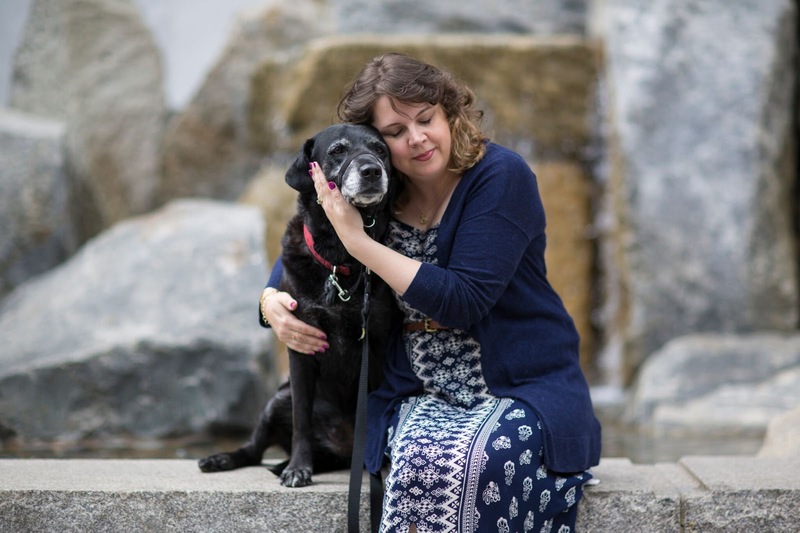 As Marty and her husband both tell us, because of what Adele and Hector do for Marty, they are closer to her than even her husband. This situation -- the bond between the service animal and the owner whose life the dog saves over and over -- will prove to be something new and different for most of us to consider, and this documentary does a very good job of bringing us up-close-and-personal with many of the details of the situation. 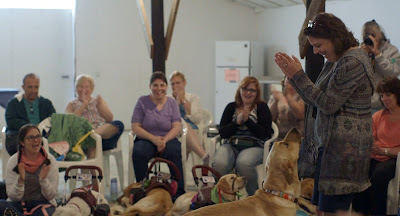 After viewing the doc, so impressed was I with the organization, Canine Partners for Life, that I am sending it a donation forthwith. Once you've seen this remarkable film, I suspect you may be moved to do so, too. From Gravitas Ventures and Long Haul Films, Adele and Everything After hits VOD this coming Tuesday, January 30, and will be available on most major streaming platforms -- for purchase and/or rental. 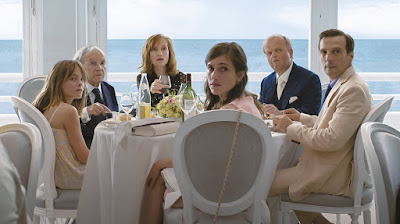 Dissecting (and eviscerating) Europe's haute bourgeoisie, as ever, German filmmaker Michael Haneke is at it once again. 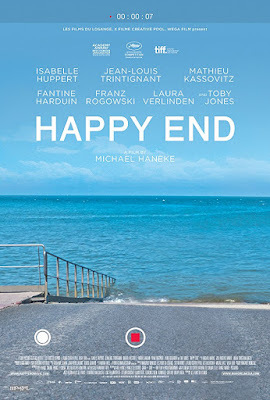 In HAPPY END he's working with those splendid actors he also used in his Oscar-winning (but not really very good) Amour --Isabelle Huppert and Jean-Louis Trintignant -- and he's added a number of other, lesser-known (except for Mathieu Kassovitz) performers, each of whom does a terrific job. 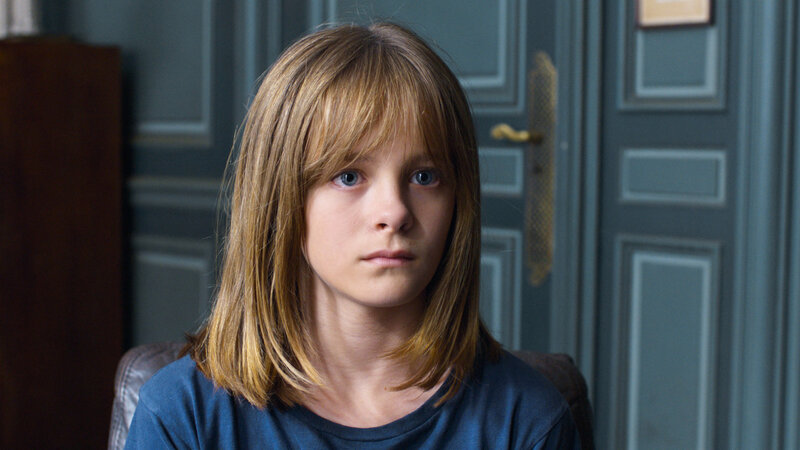 Especially fine is the young actress Fantine Harduin (shown two photos below and already seen in both the Spiral TV series and in Fanny's Journey), here playing the family's subversive and highly problematic grandchild. The spot-on scene between her and Trintignant toward the film's conclusion is a keeper that also deftly manages to bring all of the movie's concerns to the fore. 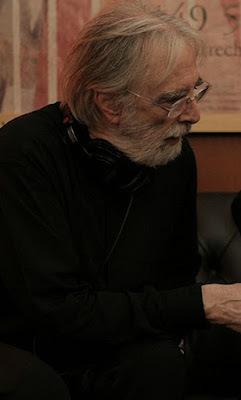 Herr Haneke, shown at left, is doing pretty much what he always does, and, as usual, he does it so well -- quietly, subtly, often indirectly -- that intelligent audience are likely to follow along, enrapt as ever. The very upper-middle class family this time around owns what appears to be a construction firm that may be having some economic difficulties, soon to be made even more difficult by an event -- shown by Haneke ever so quietly, suddenly and at the perfect distance so that it becomes what TrustMovies would call one of the year's best "special effects" -- that helps set things on their ever-spiraling and downward course. 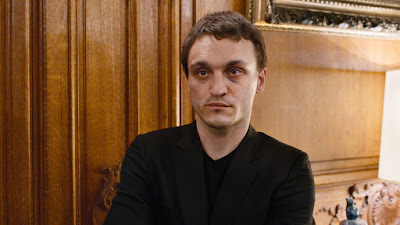 If that very pretty granddaughter, above, has her difficulties, so, too, does Trintignant's other grandchild, played by an actor new to me but very worth seeing, Franz Rogowski (below). These two young people have problems that are quite obvious. Less so are those of the family matriarch, Trintignant's daughter (played by Huppert, below, commanding and cold, as she so often is) and her sleazy, superficial younger brother (played by Kassovitz, two photos down). Britisher Toby Jones (shown second from right in the photo at bottom) joins the group as Huppert's fiance, a moneyed fellow who just might pull the ailing company out of its doldrums. The family is cared for and waited upon by a group of French-via-Algeria-looking servants, who are treated not quite badly (but not quite well, either). All this comes to a delightfully dark head at the engagement party for Huppert and Jones. From the film's beginning right through to its finale, Haneke sees to it that our modern technology plays a major part. How he does this is both clever and unsettling -- which is, one way or another, ultimately the case with all of his films. From Sony Pictures Classics, Happy End (ah, the irony!) 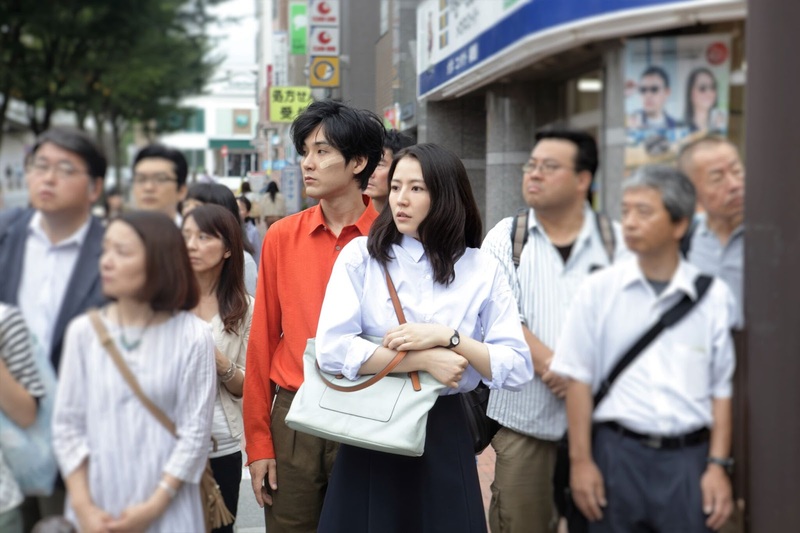 has already played a number of cities throughout the country during its large though limited theatrical run. Click here to see all current and upcoming playdates, cities and theaters. He's been doing this for quite some time. With 62 credits under his belt, writer-director-documentarian Amos Gitai has been tackling the fraught question of the creation of the state of Israel and the yet-to-be-created (in our modern era) state of Palestine, along with so many other questions involved in Jewish and Arab life, for 44 years now. 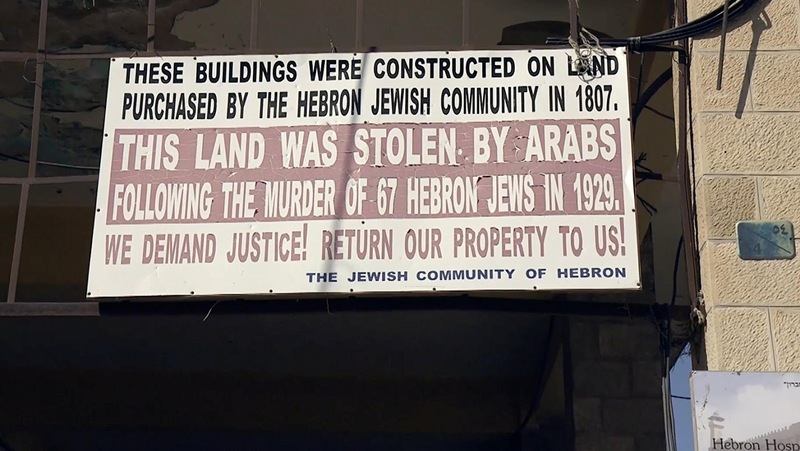 And yet the world -- especially that section of the middle east known as The West Bank, the Gaza Strip and certain other surrounding locations -- seems no closer to Middle east/Israel-Arab peace than 70 years ago when the state of Israel came into being. 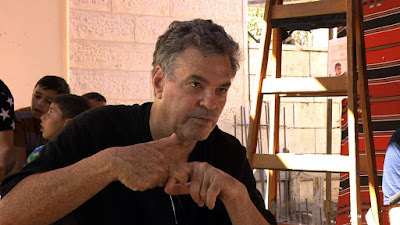 Mr. Gitai, shown above, who gave us the 2016 amazement Rabin, the Last Day, now turns his attention to the continuing struggle for Arab rights in (what is now) the state of Israel. 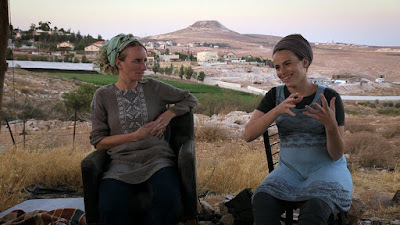 His new film, WEST OF THE JORDAN RIVER, is a kind of series of video (or, for the older examples, filmed) "snapshots" of interviews with various individuals or groups mostly working toward peaceful and fair solutions to the conflict. It chronicles these from at least 1994 onward till very recently. We see and hear Rabin, of course, and realize all over again what a huge loss this leader's assassination meant to the peace process. 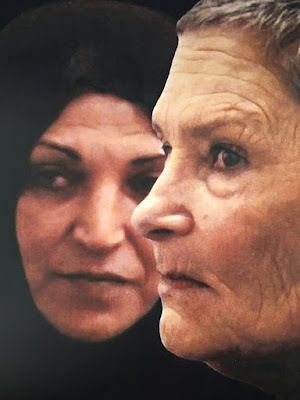 We also witness an interview with Arabs in Gaza from 1994 and watch in surprise as they single out Yasser Arafat as a traitor and betrayer for his attempt at working toward peace. More current and unsettling, however, are the little interviews to which we're privy that involve everyone from young Arab men to a not-yet-adolescent Arab boy, above, who speaks with great desire and expectation of becoming a martyr. 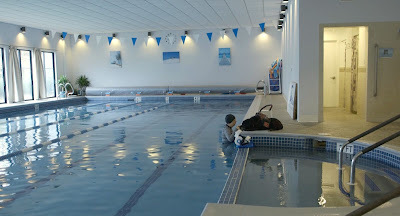 Gitai tries to help the boy see perhaps some other possibilities. But no, nothing can compare to this one! 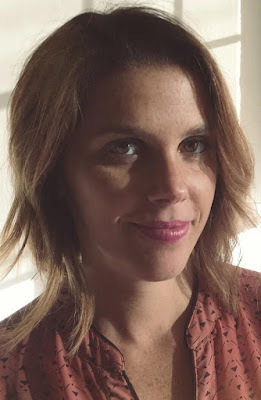 We see a clip of the fine organization Breaking the Silence and, about a half-hour in, we meet an Israeli journalist who offers up the most damning and difficult things regarding Israel's expected and far too immediate future. Parents -- both Palestinian and Israeli (shown at bottom)-- who have lost their children to this violence bond and share their sorrow in one of the documentary's strongest scenes, and when Gitai speaks with a group of Arab men, it may remind you of similar discussions from the recent doc, In the Land of Pomegranates. We hear from Knesset members, past and present -- one pro-peace, the other (to my mind, at least) sleazily pro-Israeli dominance at any cost. Then, finally and most surprisingly, we meet a couple of "settlers" (below) who -- oh, my god -- seem to actually want peace. The movie is definitely weighted toward peace and justice, for all the good that would seem to be doing at this point in history. 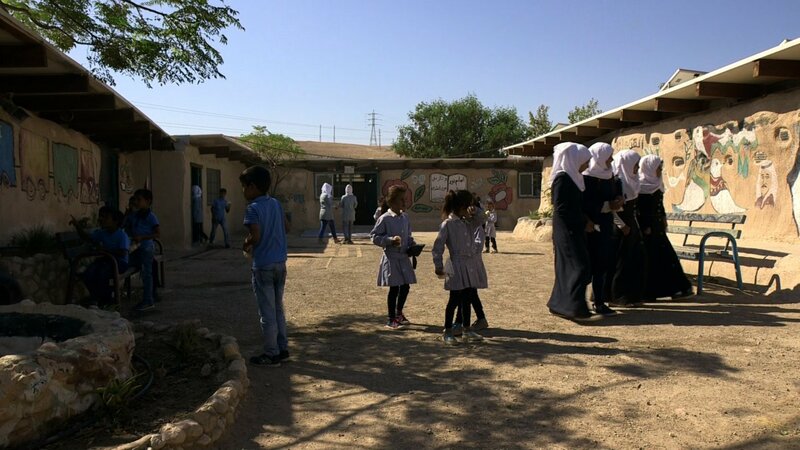 One of the most unfair and unnecessary injustices is shown us in a scene involving a hugely helpful and quite necessary school for Bedouin children (below) that the "settlers" are trying to close down. While there is not a whole lot here that hasn't been seen, heard or considered at some point along the way, Gitai's doc makes clear that it remains absolutely necessary to keep trying to bring an end to the injustice and violence that has plagued Israel/Palestine over the past half century and longer. The movie closes with shots of a lovely carousel spinning around, and with an event that includes food, music and dance and brings together Arabs and Israelis. 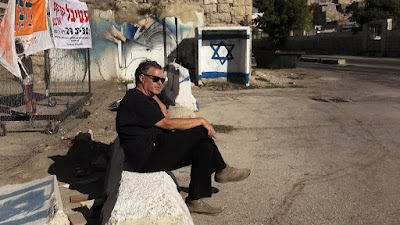 But just as with climate change, and as that journalist mentioned earlier points out, for the state of Israel there is but ten years -- at best -- remaining before the "point of no return" has been reached. 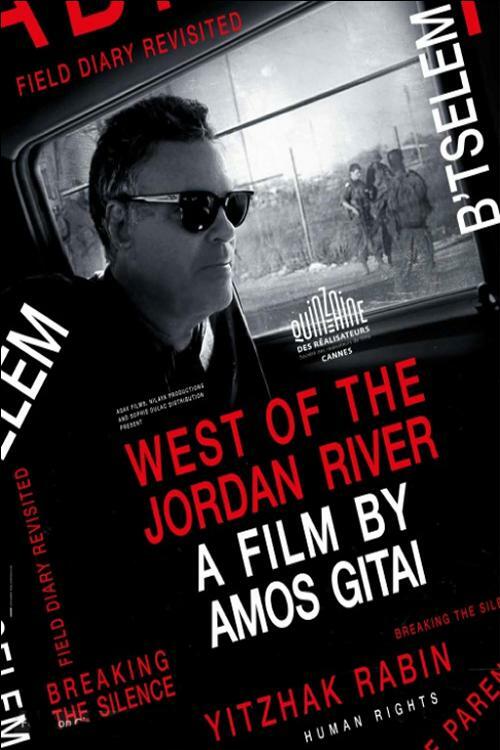 From Kino Lorber and running just 88 minutes, West of the Jordan River opens tomorrow, Friday, January 26, in New York City at the new Quad Cinema. Elsewhere? I would hope so, but according to the film's web site, no further playdates around the country seem to be scheduled., Eventually, one hope we'll be able to see the film via streaming and DVD. Not comparable with much else that TrustMovies has so far seen, especially in the realm of animation, Chinese filmmaker Jian Liu's new bizarre concoction entitled, with supreme irony, HAVE A NICE DAY proves such a darkly amusing look at China's underside -- does this country possess an "upside"? Even when we see its cultural capitals and sleek skyscrapers, there always seems to be nefarious doings afoot -- that our grin turns quickly into a grimace. 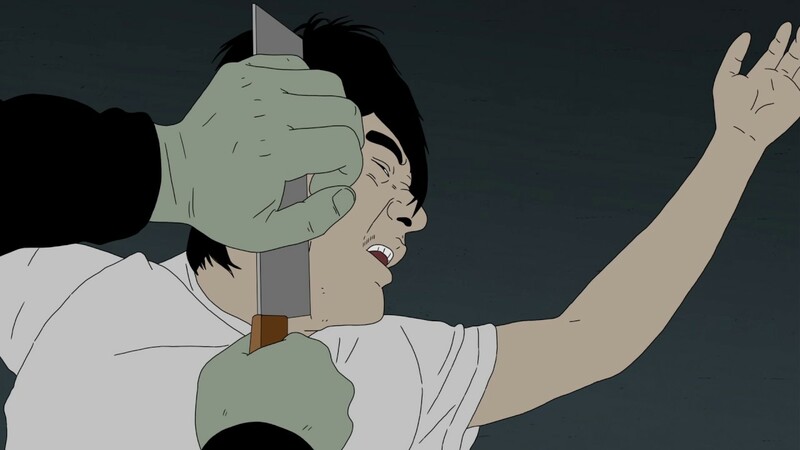 It seems that not only criminals, gangsters and family members are dirty, but maybe even some Buddhist monks, as well. "Dirty" may not be quite le mot juste, however, as these folk are simply trying to get ahead (or merely survive) as best they can. What they do ranges from criminal (unless stealing from a criminal is not a criminal act) to merely immoral, very violent or just plain mean. Jian's movie is full of economics, humor, philosophy and politics -- though the latter is, I suspect, somewhat buried. If I were Chinese I'm sure I would have gleaned at least double the amount of information and enjoyment from the film, yet what I managed to get still provided an awfully good time. 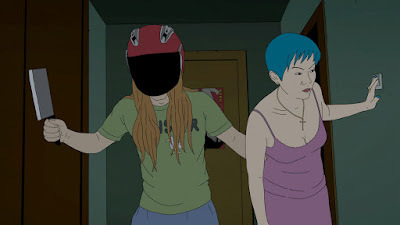 My favorite moment comes as a criminal couple (above) imagines their upcoming life in Shangri-la (below) as a kind of musical number done in the style of those old Chinese Communist propaganda songs. 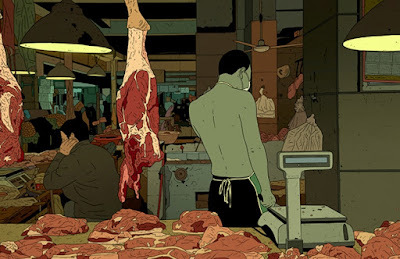 Among the philosophical wonders here is the explanation by one character to another of why freedom actually equals consumerism, while what you get depends on where you buy. This is quite the original little gem. 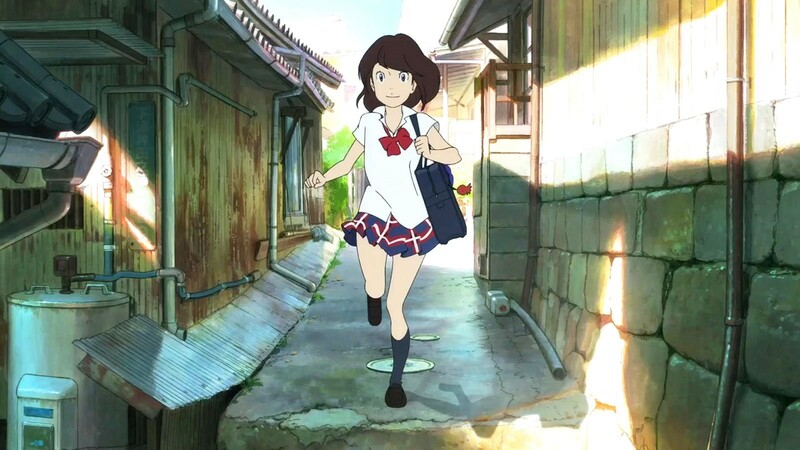 Animation-wise the movie's simplicity also proves its great strength. Jian mostly uses stationary backgrounds in front of which the action takes place. 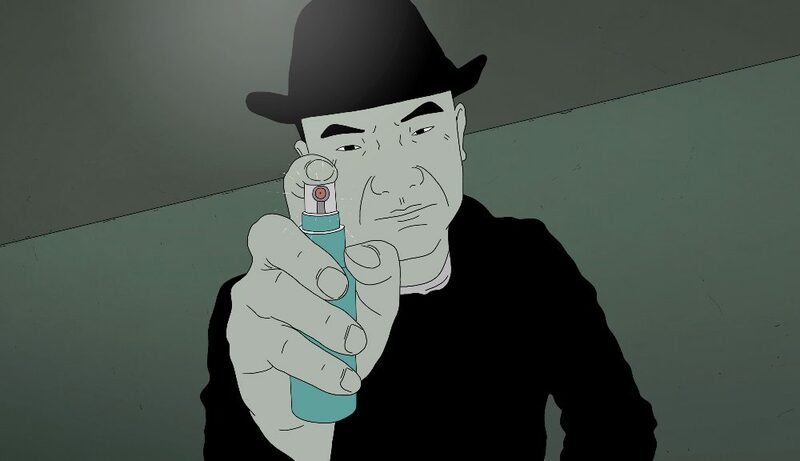 It's an odd combo of realism and stylization, and it works very well to create what you might call animation noir. 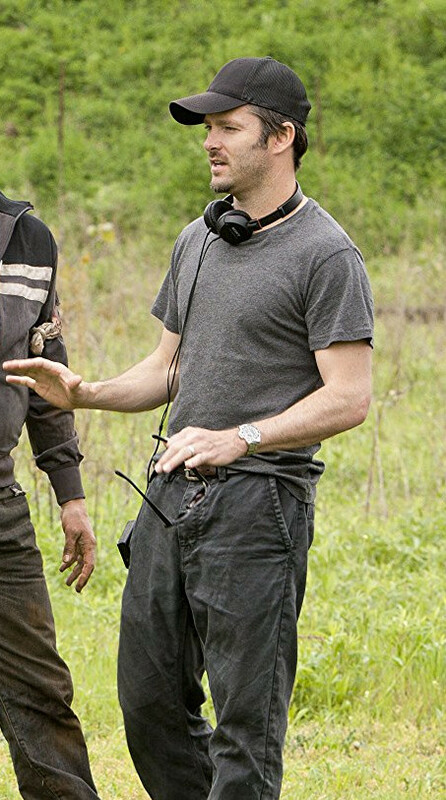 There is so much dark fun to be had here, with much of this coming from the fact that (probably to keep his budget in tow) the director cuts away from almost all of the kind of excess blood, gore, car crashes and "action stuff" that so many of our current blockbusters delight in overdoing. From Strand Releasing and running a just right 77-minutes, Have a Nice Day opens this Friday, January 26, in New York City at the Angelika Film Center and in Los Angeles, the following Friday, February 2, at Laemmle's Ahrya Fine Arts -- after which it will play another 18 cities across the country. Click here, then scroll down to click on Screenings in the task bar, to see all currently scheduled playdates, cities and theaters.